One of the finest producers of maps ever, Jan Jannsson was born 1596 in Arnheim, and died in Amsterdam in 1664. He began by producing maps of France and Italy in 1616, then issued an atlas in 1617. His works, which are much sought-after by serious collectors, were published in as many as five languages. Jan Jannsson was the contemporary and rival of another acclaimed Dutch map-maker, William Blaeu. It should also be noted that he constructed globes. From private collection of Harry Woodring, Secretary of War (under F.D. Roosevelt) during WWII, now deceased. His wife was a relation of President Calvin Coolidge. Framing: Contemporary Archival, for preservation. 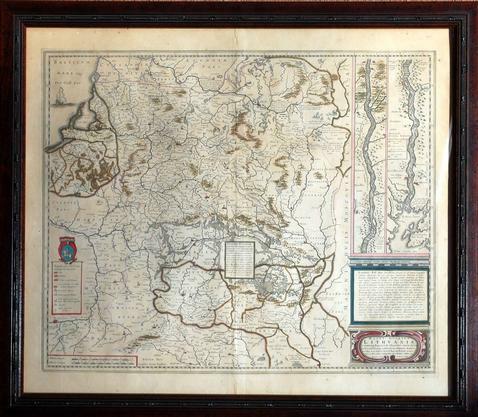 Framed to show reverse side of map.